Recently, TV producers have been asking me for insights about paranormal trends. Some already have a good idea for a TV series. Others want me to suggest ideas, locations, or possible cast members. Also, I’ve created a free, eight-page report (PDF) explaining these trends in more detail. Click here to download Paranormal Trends – April 2018. People are less interested in the adrenaline spike (“Dude, run!”), all by itself. It’s fun but, they also want more information, like exactly what is going on, and perhaps why it’s happening. They still want thrills, but they want to feel assured that what they’re seeing is real. They’re revisiting the concept of haunted/energized objects. That covers “cursed” objects as well as weird things that keep landing back at the local second-hand shop. This is a more in-depth interest than in the past. “Okay, it’s haunted. What now…?” That’s a comment I’ve been hearing as people joke about past TV shows. I’m not sure if they want a “where are they now?” segment about past show locations (and their owners), or if they want something that goes into really dealing with haunted houses. “What else is haunted/weird near [location]?” Or, “is there another place that has the same kind of weirdness as [location]?” Instead of a series of episodes that hop all over the landscape, people want a cohesive connection between the episodes. Think of it in terms of a scripted series, and each episode ends on a connected cliffhanger, not just a “Next week, on this show…” preview. Over a week ago, I asked several respected friends to share their thoughts and comments on these trends (and others that they see). 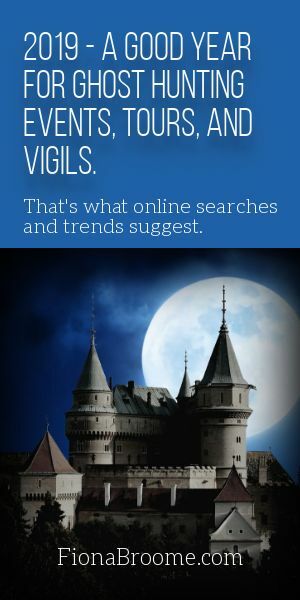 I even put a request at HollowHill.com, my most popular ghost-related website. I several great suggestions, which are going into a free report I’m writing, today. But, fewer than five people were willing to talk with TV producers, even if it might mean starring in a TV series. Wow. That’s a trend I never saw coming. If I’d posted this same article just three or four years ago, I’d have been deluged with “I want to be a TV star” messages. At this point, I have to shift my attention back to my current projects: the free ghost hunting courses, my books, an upcoming appearance on George Noory’s radio show, and so on. But, don’t worry. You didn’t miss your opportunity altogehter. If you have a strong background/interest in paranormal research, and you’d love to share your ideas with TV producers, you can still do that. Leave a brief comment (with a link to your website) at this article. I’ll point TV producers to it, so they can contact you directly. Comment with your views about paranormal trends in general, in real life and on TV, and what you’d like to see on TV (or even be involved with). Every few days, I’ll approve all non-spam comments, and – time permitting – reply in comments of my own.